The Face Mask orthodontic appliance or Reverse Pull Headgear consists of a wire face frame with forehead and chin guards as well as removable elastics. There are foam pads that attach inside the guards for a soft cushion. This Face Mask is used when the upper jaw is too far back in comparison to the lower jaw. This can be referred to as an “underbite”. The Reverse Pull Headgear or Face Mask will help pull the upper jaw forward to correct the skeletal imbalance in addition to correcting the bite. 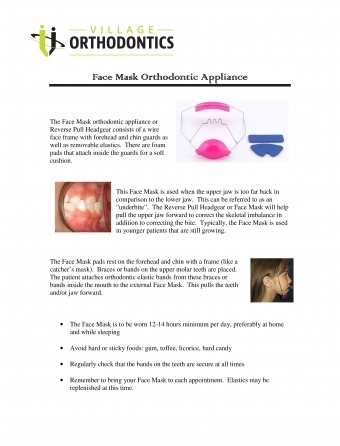 Typically, the Face Mask is used in younger patients that are still growing. The Face Mask pads rest on the forehead and chin with a frame (like a catcher’s mask). Braces or bands on the upper molar teeth are placed. The patient attaches orthodontic elastic bands from these braces or bands inside the mouth to the external Face Mask. This pulls the teeth and/or jaw forward. Remember to bring your Face Mask to each appointment. Elastics may be replenished at this time.